Just a quick question regarding RDF Training, physicality and fitness. I have recently applied, passed the fitness test, the interview and am awaiting call for the medical for the RDF based here in the North West. I was just wondering what is expected and required in terms of physicality of training, what takes place and what one would be expected to be able to do and achieve. I am in no way put off by the physical challenge and I am in very good fitness myself, I am just interested as to what I can expect. You must get min grade 4 in each (push ups/sit ups/2 mile/10km) to pass each. The grade you get in part 2 is an average of the 3 results in the 3 exercises. A failure in any part of part 2 is a failure overall. Some courses require to get better than grade 4. The amount of exercises / time you have varies depending on your age group. Last edited by DeV; 3rd January 2015 at 14:09. As I said, I am in good fitness, I compete in triathlons,marathons etc so I am in no way scared of what lies ahead. I am also 33 so I have been told that any fitness tests from now on will reflect and by graded taking my age into account. The 32 push ups and 35 sit ups, are they timed as a matter of interest. I know each Coy is different but can one expect any great deal of physical stuff during weekly classes at recruit camp etc? Last edited by Truck Driver; 27th January 2015 at 20:20. The body calipers Are only for people who have high bmi ( fat ba****ds) as they are known .. The body calipers Are only for people who have high bmi ( fat ba****ds) as they are known . 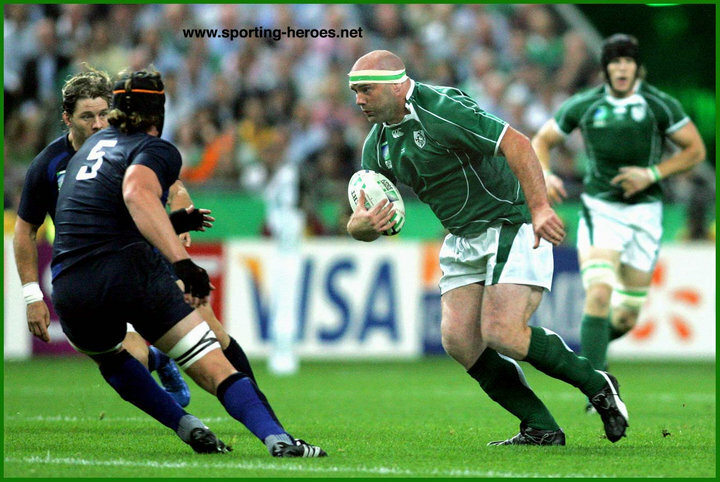 John Hayes, Rugby player would fit the criteria requiring body calipers when he was winning games for Ireland and Munster. I'll pass on his address so you can call him a fat b'stard to his face. I'll even throw in the stepladder. I caliper every year I do the IT's ( 8 out of 10 now ) and have never done worse than GIII. Grade 1 last year and trying for the same this year. ....The body calipers Are only for people who have high bmi ( fat ba****ds) as they are known ..
Just as an aside, muscle does not weigh more than fat. A pound is a pound, a kilogram is a kilogram. Muscle is more dense than fat, as such it takes up less space than fat, so if you were to measure by volume it may seem like more, which I'd imagine is where the confusion comes from. As pointed out above, the BMI scale isn't the be all and end all and in my opinion, is just a lazy way of screening people. The calliper's are far better and much more accurate. Never new john Hayes was a member of the DF? So all the guys getting calipers are international athletes buy shape and fitness?? No I don't think so id say possible over 90% are over weight / fat!! We are being to pc on the issue incase we hurt feelings..
Guys going down for easy IT,s once a year and scrap by on bmi is not good enough FACT.. Sorry if this for some makes me like the bully in the school yard but I it offends chances are your the problem!!! So hide behind john Hayes all you want over weight is over weight..
Im 38 now and have so far managed to get a grade 1 in my last test - for the youngest age group. My philosophy is simple, train hard, fight easy, live long. The fitness of the machine which carries your consciousness (body) and by extension, your "general" health is one of the few assets you're given at birth which cannot be taken from you without at least some cooperation on your own behalf. If a guy/girl is overweight? so what, get them to stop b*thching about it and encourage them to want to put down the pies and pull on the gym gear, we all struggle with our own weight / body at some point. At minute im trying to remove a soft lumpy front and sides, whilst im still fit, going running and feeling this wee bit of a gut jiggling under the thermal layer is disgusting to me. Ive seen all sorts of carryon on the ITs , in general though i got the impression that whilst most everyone was out to do well, there were some there who wanted to just about pass and Ive seen PTL's under PTI supervision, let people away with some of the most woeful pushups and situps imaginable. I know from my day, I could do sit-ups and press-ups no problem, put any weight bergin on and walk all day with it no problem at a steady 3-4 miles an hour, but I really struggled with the running. I used to train, I used to pass (most of the time) but I HATED it! When I came out I swore I was never running again! Last edited by Flamingo; 29th January 2015 at 11:04. BMI also assumes that body fat scales with the square of your height, which isn't true - theoretically you'd think it'd be more like 3, but I once read an article that said a power of 2.3 or so is closer to reality. Most of the rugby players that people like to point as examples of healthy people with high BMIs at also happen to be quite tall, and thus their BMI is higher than it would be for someone of similar build who is of normal height. Isn't the minimum height still 5' 4"? I'm not fat - I'm just too short.